Here’s the link to a .PDF of SPJ DePaul Adviser Mike Reilley’s iPad2 for Journalists presentation from the SPJ Super Regional on April 2. As a supplement, here are highlights from an #SPJchat we had on the iPad2 recently. Here’s a great website for finding the best in cameras, tripods and other gadgets for journalists that was mentioned during the presentation: NewsGear.info. 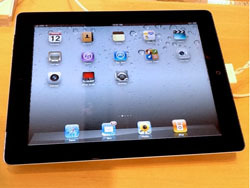 This New York Times article offers some tips and tricks for getting an iPad2 from an Apple store. Read your Twitter, Facebook and RSS feeds in a magazine format. Edit video on your iPad. Mike prefers Reel director. Records audio and transcribes it for you. You can then e-mail to yourself. This app is good for short, quick interviews and does save some time, but make sure to edit the transcription closely as there are many errors. Use this app to track, edit or share any of your Delicious social bookmarks. There are many RSS news readers out there, but this one works the best. Load or create Excel documents. If you use the iPad for sketching and concepting, this app is for you. You can e-mail sketches to participants after you’re done, and there’s no need for a marker board. Works great for small teams of 2-4 people. Like PowerPoint and Keynote, you can build your presentation on a desktop by going to the websites and setting up an account. Then you can download the free iPad apps and use the iPad to present them. Very cool tools. Nice for scheduling Tweets to go out later. Manage up to four accounts for free, then you must pay. Manage your contacts and follow their posts/links. Manage your Facebook account with this app. I just prefer calling it up in the Safari browser. Search any topic and it gives you instant data, census information, maps, etc. A must for any journalist. From Poynter: Looking for some good iPhone apps? Here’s a good list to get you started. ALWAYS notify the person you are interviewing that you are recording a phone or Skype conversation. Get it on the recording. Here are some apps that can be helpful for recording audio/video of phone/Skype conversations. iPhone: I use the Recorder app (different from Pro Recorder) to record phone conversation. The app is cheap and works great, allowing you to record a conversation, email it or post right from your phone. The app even tells the person you’re calling that you’re recording the conversation. Desktop/Skype: You can download an app from the web called Call Recorder (just Google it) for $15. Great add-on to Skype that allows you to record video and/or audio of a Skype call. Great for doing interviews and then editing/posting to a site. Best $15 I’ve ever spent.